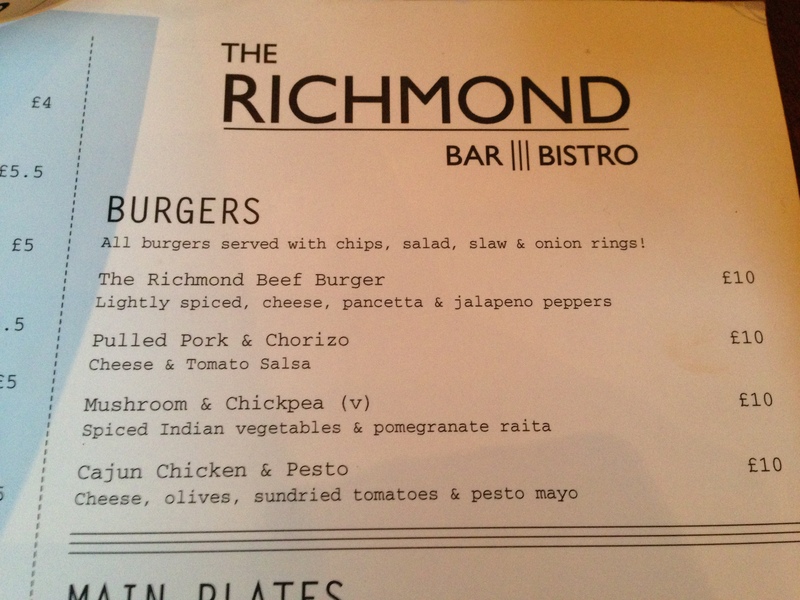 The Richmond has been on my ever-growing ‘to-do’ list of burgers for some time now. I’ve heard great things about the restaurant from food bloggers and friends who have previously visited. It’s one of the restaurants that’s been on my list for far too long now and a visit was long overdue. 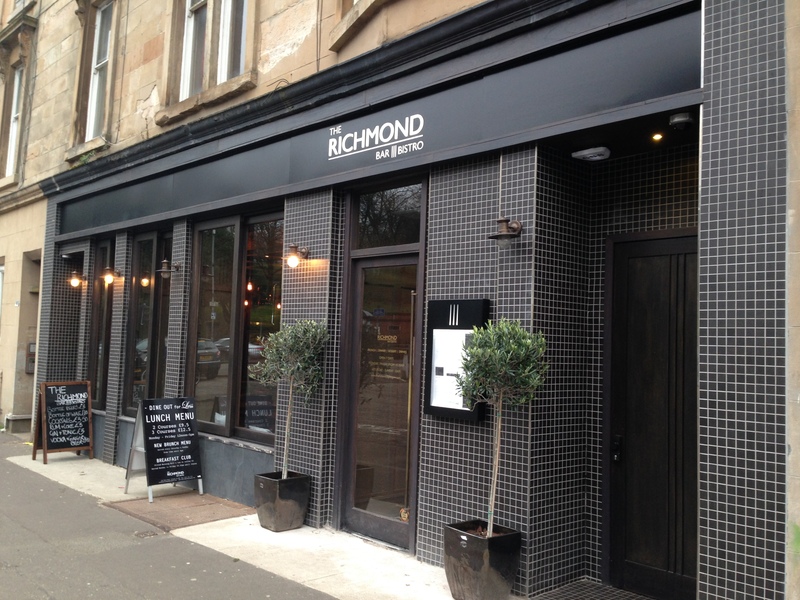 Tucked away at the end of Park Road in Glasgow’s West-end, the Richmond is a very impressive venue. From the moment you set foot in the door, everything feels very warm and welcoming. You can tell that a lot of money has been spent on the Richmond, from the grand bar area to the countless, stylish features throughout. The staff were super-friendly too, from the moment we walked through the door. The menu consists mostly of classic gastro pub dishes, but with a slight Indian influence. I went for the Richmond burger, which consisted of a spiced beef patty topped with cheese, pancetta and….jalapenos, which seemed like an odd thing to have on the burger. It was served with coleslaw, onion rings, fries and salad. Presentation-wise, it looked a little flat. It wasn’t an exciting dish to look at and for £10, it seemed a bit on the small side, especially when compared with alternative choices in Glasgow. 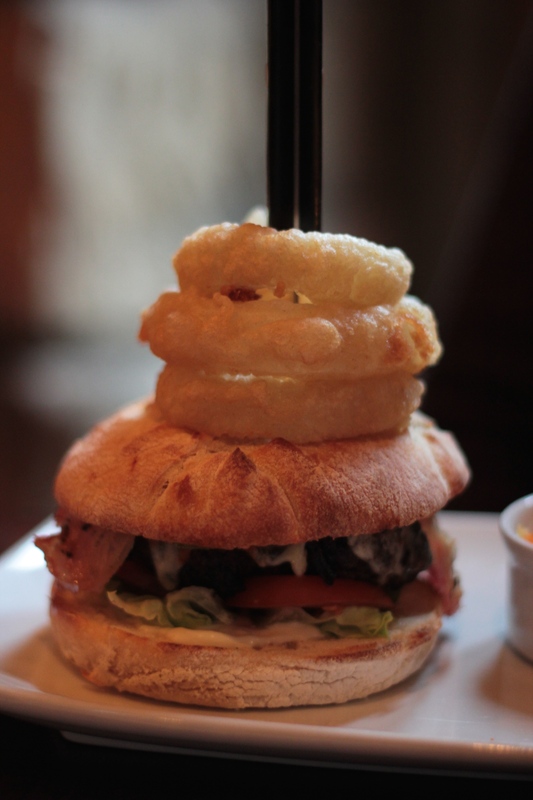 The burger came served on a lightly toasted ciabatta bun, with the onion rings placed on top, rather than on the burger itself – always good. 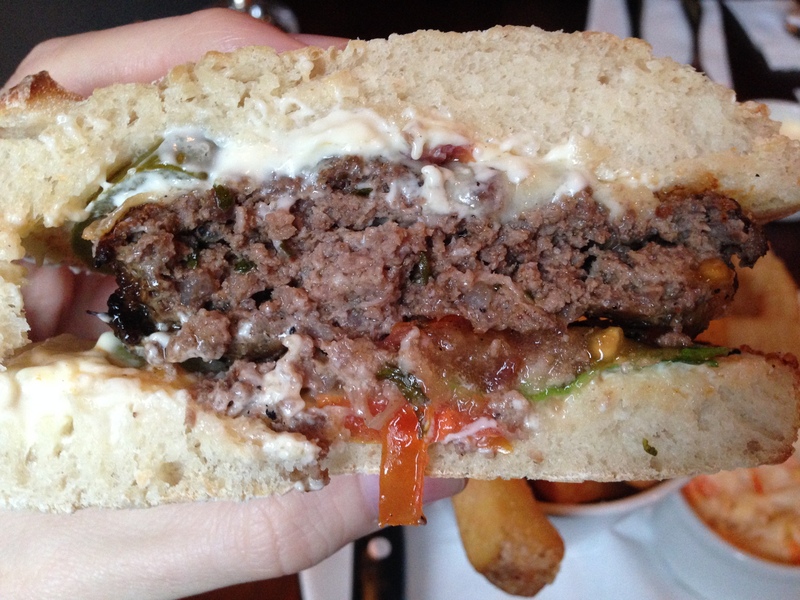 I’m normally not a fan of burgers on ciabatta, as it can be fairly tough but this bun was light, soft and slightly warm. It had a little bit of crunch, which was actually quite nice. Regular readers will know that we’re all about the brioche bun here at, but this was actually a nice change. Unfortunately, the rest of the burger wasn’t quite as good. The patty; despite being nicely spiced, was dry and a bit overcooked. Despite having quite a nice sear on the outside, it felt as if all of the juices from the meat had been lost during cooking. The pancetta tasted good, was light and worked well with the melted cheese. The jalapenos on the other hand, were a low point. They seemed out of place and together, these toppings just didn’t work as a combination. I appreciate the delicate influences of Indian cuisine that have been infused throughout the menu at the Richmond and I couldn’t help but feel that a classic bacon cheeseburger with the spiced patty would have worked better. I’m all for unusual combinations and trying weird and wacky burger creations and the jalapenos certainly added a little heat…but felt very out of place. As previously mentioned, the onion rings were placed on top of the burger. This was a good thing, but the onion rings themselves were overly-greasy and soggy. 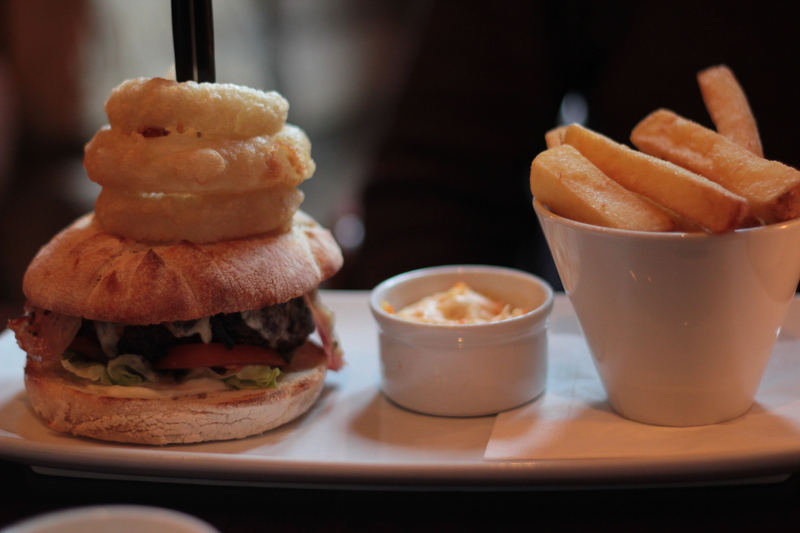 The burger came served with chunky chips, which were decent – better than the actual burger itself. I had previously heard very good things about the dessert menu at the Richmond – in particular, the chocolate & mascarpone samosa, with nutella, maple syrup & ice cream. Despite the burger not being much to write home about, this dessert was absolutely incredible. The samosa was extremely light, crisp and the warm chocolate was absolutely perfect. This didn’t sit on the plate long and was practically inhaled. Easily one of the best desserts I’ve ever had in Glasgow. I had such high hopes for the Richmond after hearing so many good things about it and being extremely impressed by the interior of the restaurant and the excellent atmosphere that it possesses inside. 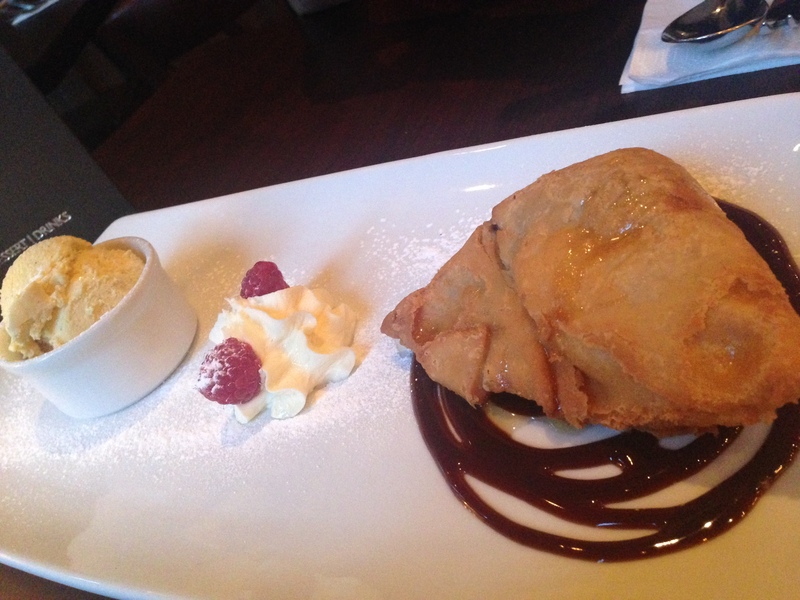 The Nutella samosa is one of the best desserts I’ve ever eaten and I’d definitely go back to have it again. We also tried the oven-roasted salmon which was delicious too. As mentioned, I loved the look and atmosphere of the restaurant and with special events like curry nights and an impressive drinks list, there are a lot of things that the Richmond clearly does right. Unfortunately; however, a burger simply isn’t one of them. + Not burger-related, but the Nutella Samosa was the highlight of the visit. Really, this was incredible. Enough to warrant a visit alone. + Patty was quite nicely spiced – not too overpowering. – Patty was quite dry. – Jalapeños seemed out of place. This would have worked better as a classic cheeseburger. 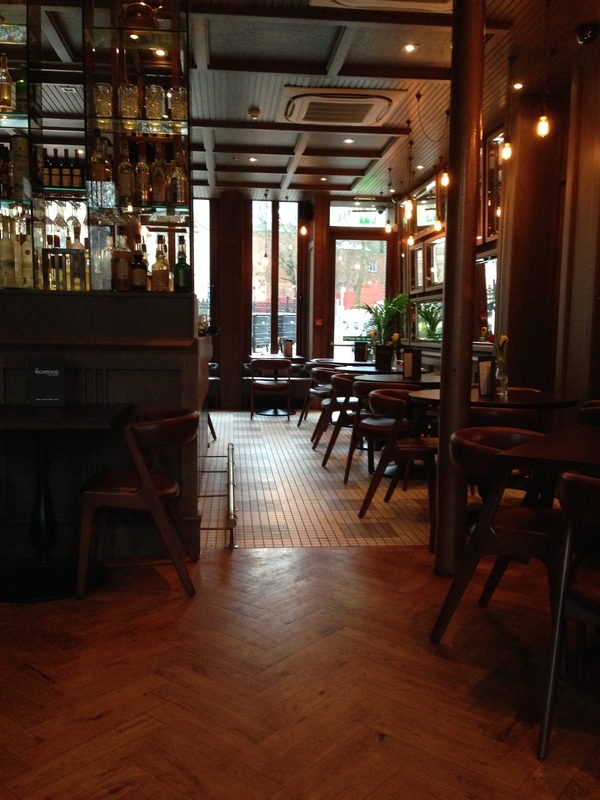 – Overpriced for what it was and compared to other, better offerings in Glasgow.